Someone has said that God’s Plans have no hurry or delay. God’s goal was to prepare a people to take the knowledge about Himself to the world. But, God had a lot of preparing to do. However, God was watching and heard the slave's prayer for help. Through a wonderful series of miracles, God saved baby Moses' life. God placed Moses in the court of Pharaoh to learn from the wisdom of Egypt. But Moses got ahead of his calling to deliver Israel when he killed an Egyptian. Moses had to run away to Midian, 400 miles from the Egyptian capital. Here, as a shepherd, God allowed Moses to learn in another "school" for 40 years. Here, just herding sheep, Moses seemed like a real failure in life. But, God still had a plan for Israel and for Moses. When both God and Moses were ready, God called Moses through an unusual "Burning Bush" experience, to lead His people out of Egypt. People all need to learn that God is in charge. God always has a super plan that He is working out. When God is ready, and when He sees man is ready, God asks man to join Him in that plan. God’s people were not ready to leave Egypt! The Israelite slaves needed greater faith. The Israelite's must see God working through the "Ten Plagues" that God put on Egypt. When the tenth plague came, there was only one way for anyone, Egyptian or Jew, to escape. God gave a test to everyone. 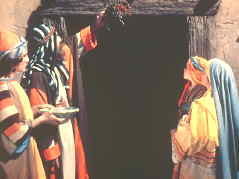 Every father must take the blood of a lamb and put it around the doorpost of their home. This blood symbolized their faith in the Saviour to come. If any family did not do as God asked, the first born son would die that night when the angel of death came by their home. This was a "live or die" obedience test of each Israelite or Egyptian family's love to God! Of course, Pharaoh put no blood on his doorpost. When his oldest son died, he became terrified. At last, Pharaoh told the Israelites they could leave to worship God in the wilderness! 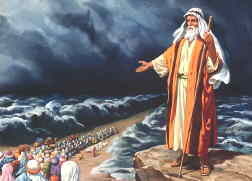 The Israelites hurried toward the Red Sea. 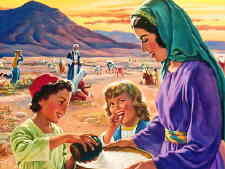 It was wonderful for the Israelite slaves to be free at last! But, how would they get across the Red Sea? As they camped by the Sea, the Israelites saw the dust rising from Pharaoh’s army. Pharaoh was chasing them! The Israelites were now caught between the army and the sea. Did God bring the slaves out to die -- caught between an army and the sea? God gave them a lesson of faith. Moses told the people to stand where they were, and watch what the Lord would do to save them. God said He would fight for them. Israel would not have to lift a finger to defend themselves. God then put a huge cloud behind them. That night- to Israel it was a cloud of fire giving them light, but to the Egyptians chasing them, it was a cloud of darkness protecting God’s people. Moses held out his rod over the water. A huge wind started, and by morning there was a dry path for them to cross. Quickly they all moved over the dry sea bed. But, the Egyptians started chasing them again. When Pharaoh’s army got to the sea, the army tried crossing too. But, when the army was in the sea bed, God let the waters come back. Every one of Pharaoh’s army died in the sea. Then came the time when God chose to speak in a huge booming voice from the top of Mount Sinai. It was such a special time with God that the people were given several days to prepare. A fence had to be built around the mountain so people and animals would not touch the mountain. God Himself would come to the mountain. Then, from the top of the mountain came the voice of God. God reminded them how He had delivered them from slavery. God personally spoke his Ten Commandments. He did not trust this to anyone. In fact, God wrote all the Ten Commandments with His own finger in stone. The people promised that they would do everything God asked. But, the people soon failed. You can read about the story of the Golden Calf and how many people lost their lives because of sin and rebellion. Moses threw down the Ten Commandments and broke them when he saw the people already breaking their promise to God. Later, God had Moses to bring another set of stone tablets (pads) up the mountain. With His finger, God again wrote the commandments on them. The new stone tablets were put into the sacred ‘ark’ chest in the most Holy Place of the sanctuary (temple). Above the commandments was the ‘mercy seat’ where God came with a special ‘shekinah’ or light. This all shows how important these commandments are. The Ten Commandments explain about God's love: what true love is, and what love is not. Jesus summed them up by saying to love God first, and love your neighbor like yourself. There is a deep lesson here for us. God knows we are very sinful. In our strength, just like the Israelites, we cannot keep His holy commandments. We have an evil nature. Naturally, we want and like to sin. We sin just like the Israelites. But, if we will let Him, God will write His love and His laws into our minds. Then with His Holy Spirit’s help, we can obey God and become more and more like Jesus in character. 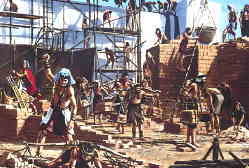 God had to take other strong measures to help prepare Israel for their work in the Promised Land. Many lost their lives in the desert because of unbelief or rebellion. One time, God allowed many poisonous snakes to come into the camp. Many people were bitten and ready to die. God had Moses put up a test on a pole. The test was a snake made of brass. If the people trusted God enough to obey and look up, they lived, if not, they died. God’s special people were so rebellious that God had to let the older generation die before they were ready to go into their "Promised Land". Finally, God miraculously led Israel into the Promised land. There, God still had many lessons of faith and obedience to teach Israel at Jericho and Ai. God wanted a people who He could trust to tell and live the good news of how man can be saved from sin.. God wanted to place the Israelites in the important travel route between the greatest countries of the world at that time, Egypt, Assyria and Babylon. If Israel would be faithful, they could teach the world the truth about a loving God! [Exodus 19:5,6] If the people were unfaithful to live and give God’s love, many opportunities to share would be lost. Not only that, many would miss Heaven because of Israel's failure. Go to the Next Section: God Illustrates How We Are Saved.